“You can’t talk here about decadence. 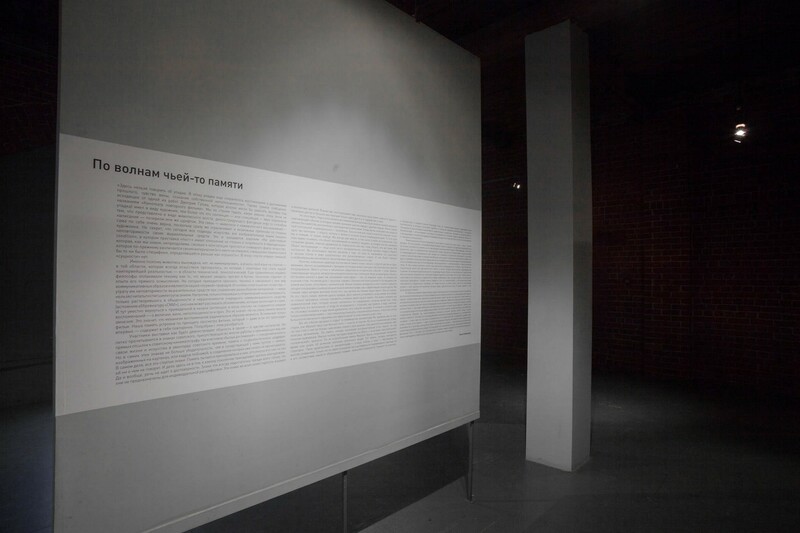 During the age of decadence, there remained recollections of the achievements of the past, a sense of guilt, and the awareness of one’s own inadequacy.” This is the direct message issuing from one of Dmitry Gutov’s works that would well have embellished the exhibition entitled “Cinema of Repeat Film”. 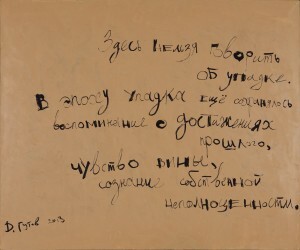 We will not attempt to guess the specific era that the artist had in mind (other than an age of decadence), all the more so as his maxim – or speculation – is patently limited to representation in the form of the painted canvas, demonstrating textural games with a form of writing – handwritten or printed. This link – between painting and a non-pictorial statement – is intrinsically very true, as it also immediately imposes limitations on possible claims from the artist. It is no secret that today all kinds of art, all possible languages, lack uniqueness as a means of expression. Put in a nutshell, this is also termed “the post-medium condition” in which the prefix “post” relates not so much to the requirements on periodization, something that is as we know irrepressible, as the assertion of a simple, evident fact: art, which differs as in the past by virtue of its material (nobody has abolished it), is completely devoid of any specifics determined previously as the “essence”. There is no “essence” in the post-decadent era. And this is the very reason why painting is forced not to mimic, but instead to find its own language on the side – in that area that art has always despised, but which has for some time now been transformed into our first, overriding reality –the area of technique and technology. Until fairly recently philosophers would deplore technology on the grounds that it prevented us from witnessing the disclosure of being, as it distances us from the experience of its direct comprehension. Today, however, they have been forced to admit: technology and the related world of communicative images are precisely our “first” nature. And therefore the “desolation” of art – the loss of uniqueness of its media despite the diversity of materials – can in no way stand for its extinction. On the contrary, it is only after relinquishing claims to uniqueness and after dissolving in the everyday and indiscernible nature of another communication means (one merely needs to recall the expression “mass media”) that it can tell us about the changes that are happening to us as well. And here it would be appropriate to go back to the sentence cited at the beginning: in the “post” age no memories are retained – of greatness, guilt, inadequacy, etc. This does not mean that memory has been replaced by amnesia. Rather this means that our mechanism of remembrance is changing radically. Only film recalls. Our memory is built according to the principle of viewing a film that contains repetition – even if this is happening for the first time. Let’s try to sort this out. The participants in the exhibition appear as it were to be unanimous in sharing one sentiment, namely, the sense of nostalgia. This is clearly discernible in the signs of the Soviet period that are present in numerous works and assume the form of direct references to Soviet cinema, and also the motifs of “the achievements of yesteryear” – the conquering of space, the links between life and art in the avant-garde of the Soviet period, the memory of social realist masterpieces. However, these very signs are no more convincing than the adjoining emptiness – the rooms portrayed in pictures or the stills of landscapes from which nothing cannot be “read” when juxtaposed. In fact, all these signs have been erased. Memory tries to get a handle on them, to depart from them, but learns nothing. And this has nothing to do with the specific generation that the spectator or artist belongs to. And indeed this does not concern certitude. These signs are always insufficient, first and foremost because they do not lend themselves to individual interpretation. These signs in all the blurring are addressed to a collective of spectators. To be more exact, they show us the extent to which our memory depends on other people – the extent to which we only obtain access to the past through other people and in communion with them. But that’s not all there is to it. A shortcoming in personal recollections could always be offset by a chronicle describing the events in which the individual participated together with other people. To put it another way, personal forgetfulness would be offset by group recollections. Now we can no longer draw on this opposition: the individual versus the universal. The age of technology in art means only one thing: we begin with what is common, which is precisely the core of any individualisation. In other words, if we remember, then we do so only collectively. We are always already together, including in our recollections. At the same time, it is necessary to understand that the subject of our recollections is not some “thing” that we grasp altogether with so many hands, helping either it, the object, or ourselves to stay above water. The subject of our recollections is more often than not something nondescript, some omission that is the source of our nostalgia. We experience a vague attraction to something that we ourselves have not experienced, that exists at best in the form of fragmented or ruined signs. And the more effaced and optional that they may be, the more sustainable is our attachment to them. It goes without saying that the change in the nature of collective memory may be linked to the loss of a sense of history, a phenomenon that is usually associated with the onset of post-modernism and its inherent, ubiquitous practices of mediation. Instead of the oral and written evidence of historical events, we are confronted by a flow of images simulating a past that is perused specifically as stylisation. Fashion, decor (houses, machines, the arrangement of rooms) and even the so-called “atmosphere” – these are all visible signs that enable us to realise that we are dealing with the past, regardless of whether this is a recent period or an earlier time. And it is naturally the cinema that provides these signs. In other words, experiencing “our own” past is mediated today by the universal language of cinema as well as the affective experience of other people. We remember through the medium of films; moreover, as spectators we remember only together. Or we don’t remember at all. Strictly speaking, however, these are phenomena of the same nature. The case is somewhat complicated when the gap or omission is not so much ephemeral but it becomes the precondition of our very memory. This can be understood as a traumatic experience that by its very definition cannot be “remembered”: consciousness does everything to repress the experience, but then it returns later on, as a rule as a symptom. However, this can also be understood in less dramatic terms: there are phantom events where only collective memory remains – they are too diffuse, too insignificant to become part of a major historical narrative or acquire any other “iconic” status. And all these phantom events are created primarily by cinema. We are surrounded by such events from all sides, they form our sensory flesh – and we don’t remember them. We don’t remember them precisely because they stand so close to us: just as it is impossible to recall one’s breath, one’s motor responses, one’s bodily automatisms. This is memory that is akin to the instrumental in the sense that it helps us survive. And this is exactly why it is so hard to identify its subject – it has no independent “aesthetic” value at all. This is not the redemptive memory of Marcel Proust, which enables us to master time or learn about the true significance of lost things. This is memory that is repeated structurally. Our pleasure from cinema – and our love for the medium – is attributable to a large extent to recognition, only this has nothing to do with the reliability of the experienced spectacle or its correspondence with any objective (let’s put it this way, “external”) reality. We recognize not the familiar, but the unknown, and we recognize this precisely because cinema creates a shared space of sensibility, in which the spectators participate jointly, being otherwise highly disconnected – in other areas national, social, language and other differences are instantaneously brought into play. Cinema is the instrument for true experiment and cognition. While universal to the utmost, it discloses forms of subsequent individualization: this is the discovery of the new as it starts out from what is blatantly non-unique. It can be expressed more definitely: our memory today is nothing other than cinema; films remember for us – and through us. This does not mean that cinema deprives the spectator of memory, that the spectator delegates to cinema not only the ability to remember, but also the actual material of the recollections. At some point Jacques Derrida tried to place the cinema in the intermediate space between communality (community) and the pleasure of individual experience. He said, yes I am in the auditorium together with others, and it is the collective that determines the film, but at the same time I am experiencing this individually, separately from the others. Let us add here the difference between the masses as the consumer of cinema and their transformation in the projection room, where the actual social bond is, according to Derrida, redefined –“neutralised”. Here it is possible to discern some sort of dialectic of the individual and the universal, where happily there is always room for phenomenology (of the cinema) with individual consciousness located in the centre. However, cinema is indifferent to the individual. And in our opinion, this is not about the intersection of numerous “phantasmatic” projections: each spectator supposedly transmits to the screen something of his or her own that is deeply personal; taken altogether these projections merge into a common image. In other words, this is not about the resonance of separate transferences. Rather, it can be stated that cinema represents the sensibility of modern man projected outwardly so that he can only know from cinema how he is actually structured – how his desires, emotions, preferences, etc. are shaped. And most importantly – how memory functions. We can adopt from Proust the idea of the involuntary nature of recollection: memory is not the property of the individual doing the recalling – he does not dispose of memory at his own discretion. Provoked by smell, sound, the tangible or visual impression, we are thrown off guard by memory. Such memory is not instrumental in the narrow sense and is related to the affects. The affects can always be found outside: they can be understood as triggers of memories, as if they were attached to the surface of things, and possibly even more stringently – actual changes or transfers from one state of a thing to another. When we claim that cinema is our affective memory, we want to say that it is here in the space of oneiric images, where the instance of consciousness is suspended, that the spectator learns about the world of which he is a part. This is a world of forces and interaction, numerous interacting forces, and human consciousness is only one partial and restricted manifestation thereof. We immerse ourselves in memory as in cinema, and in cinema as in memory – here, through the concatenation of visible images – it opens up new relations, new opportunities and registers of perception. Cinema persistently teaches us one thing – the insufficiency of historically variable representational codes. At the same time, it is immeasurably more than a simple combination of phantasms. It is the world itself where the human and naturally memory is in a state of constant change; only the observer (spectator) perceives this change through repetition.